This Bengali Magazine Combo pack has been designed keeping in mind the reading habits of the Bengali people. All the magazines are procured new from ABP Group and ship directly to the customer’s place. 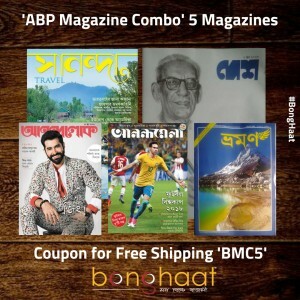 This combo pack of Bangla Magazines will consist of 4 fortnightly magazines namely, Desh Magazine, Anandalok Magazine, Anandamela Magazine, Sananda Magazine and one monthly magazine i.e. Bhraman Magazine. All these magazines are procured and packed new. In this combo offer consists of current issues of the magazines only. Enjoy reading your favourite Bangla magazines at the convenience of just a click. 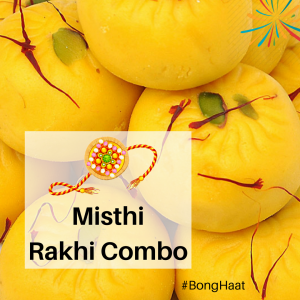 To celebrate Rakhi as a Bengali occasion, online portal BongHaat.com brings to you Mix Love Rakhi Combo symbolizing the strong bonding between brothers and sisters. 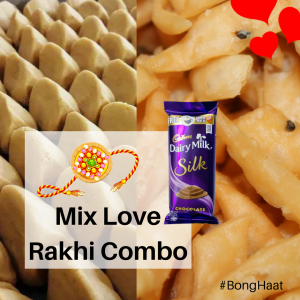 This Rakhi combo pack consists of Ganguram Mango Sandesh (450 grams), Mukharochak Nimki, Mukharochak 100% Love Chanachur, one Cadbury Silk Chocoloate and one Rakhi. This Rakhi Combo will delight you both in terms of gifts items and value for money. Cookme, a household brand across India, enjoys the 170 year culinary heritage of Shri Krishna Chandra Dutta’s business acumen. We at Bong Haat have handpicked this assortment of Bengali Spice (Masala Powder) Combo specially for you. This Bengali Spice (Masala Powder) Combo pack has been designed keeping in mind the popularity and usage of them in Bengali kitchen by the Bengali housewives. All the items of this combo pack are sourced from Cookme Masala in Kolkata. This My Choice Spice Combo gives you the flexibility to choose the items and its quantities as per your requirements. 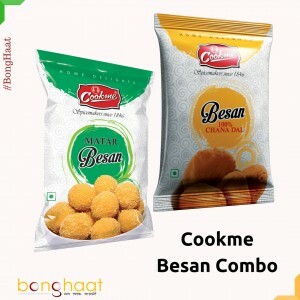 Book this My Choice Spice Combo pack from Cookme Masala at the convenience of just a click and live a life in a Bengali way. With this regular spice combo from Cookme will make your food a lip smacking one as Cookme believes in making everyday a delicious journey.